“De Kennis van Nu” is the scienceprogram of the public service broadcaster NTR, featuring Elisabeth van Nimwegen and Diederik Jekel. Their episode that aired 10 october 2016 was all about ‘the bacteriophage’. De Kennis van Nu is broadcasted every thursday at 19.20 CEST (UTC/GMT +2 hours), NPO 2 (Dutch television channel). Bacteriophages are everywhere: on the table, in bodies of water and in our intestines. Phages are able to kill bacteria in a very targeted manner. They may provide a solution to the growing threat of antibiotic resistance in patients, but also in agriculture, animal health and food safety. “De Kennis van Nu” will look at why this miracle drug is not yet used on a larger scale. In the following fragment Micreos’ Dr. Steven Hagens shows us what makes the phage so effective at killing bacteria. When a patient with a bacterial infection is no longer responsive to antibiotics, then phages may be a last resort. At the Military Hospital in Brussels, in some exceptional cases, patients who can no longer be helped by antibiotics are administered phage-cocktails in the form of a spray or rinse. Scientists want to do more research into the potential of phages, but find that regulations pose an obstacle. In this episode Elisabeth went phage-hunting at a sewage treatment plant, in the poop of animals at the petting zoo and at a public toilet. The dirtier the place, the greater the odds of finding phages. Diederik dove into food safety: he visited Micreos Food Safety, where he learned about the phages’ potential to improve food safety by killing harmful bacteria in food. See the promotional video below. The full (24:36) video can be found here, on the official website of De Kennis Van Nu, specially dedicated to Phages. 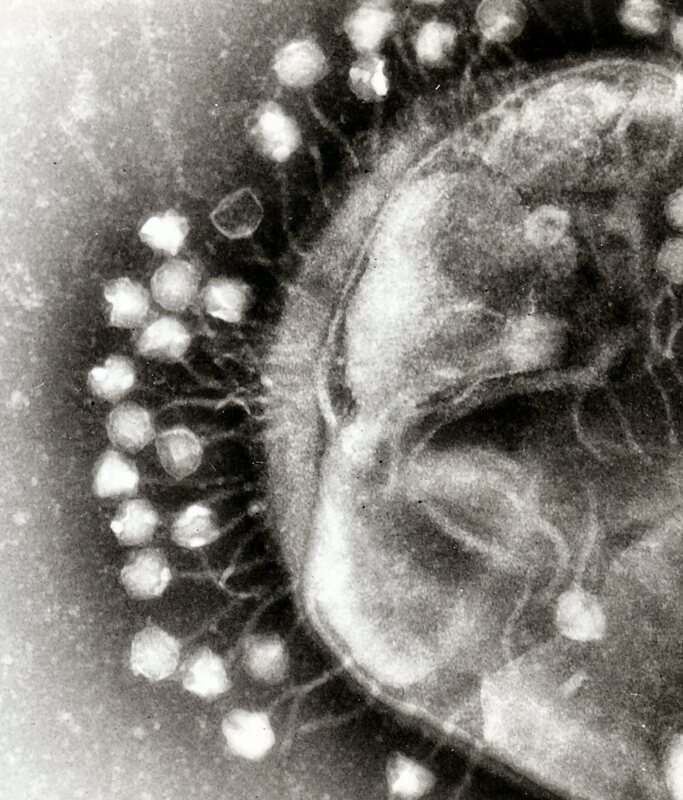 How does a phage kill a bacteria? The phage searches for a bacteria and latches on to it. Subsequently the phage uses its tail to inject his DNA into the bacteria. This DNA replicates and causes new phages to be created in the bacteria. These phages secrete an enzyme (endolysin), which is used to rupture the cell wall, causing the bacteria to burst and die. This releases new phages from the bacteria. Where antibiotics kills all bacteria at once, phages are much more specific. Phages only match with one specific bacterial strain, causing them to leave all other bacteria unharmed. This leaves the micro biome undisturbed and all “good” bacteria intact. Keeping in mind antibiotic resistance, phages may very well provide the solution. To this day no cases are known where bacteria display resistance against endolysin. Are phages a viable alternative for antibiotics? Even though they gradually change in small steps, they do adapt causing them to become resistant to antibiotics. Antibiotics are static substances, unable to change. A phage however, continually evolves and adapts. This causes a continuous arms race; bacteria adapt, become resistant to phages, phages adapt and over time are able to attach to the bacteria. This characteristic causes the phage to be a potential candidate to help combat bacteria that have already developed a resistance to antibiotics. As far as we know now, the use of phages pose no risk to patients. Still it needs to be noted that phage therapy is not yet used within the European Union. Why then is phage therapy not yet used within the European Union? The European Union requires new pharmaceuticals and medicines to undergo extensive research, before they can ever be sold. This may easily take ten years to accomplish sufficient research. This is how we in the European Union know that a pharmaceutical product or medicine works and what the side-effects are. The problem here is that phages are not static molecules. In ten years time, phages and bacteria could have evolved multiple times. The benefit of the phage is also its weakness. It is able to kill bacteria by continuously adapting and changing, however, this also makes it hard to fit into regulations. Given the fact that there are no official guidelines yet for phages, many doctors do not yet know about the potential application of phages as a medicine. There are some successful treatments being conducted in Europe, yet this is solely experimental in nature. Could phages also be utilized in more common situations such as a urinary infection or gallstones? In the Netherlands phages are currently only used as a last resort in dire cases. The idea is not to apply phages in the same manner as we do antibiotics; simply not enough research has been conducted. One of the problems is that if you want to combat a specific type of bacteria, you will need to find a matching phage. Now that many bacteria are becoming resistant to antibiotics and antibiotic resistance is finally receiving the recognition it deserves, the scientific community is looking for alternative remedies. More and more research is being conducted with regards to phages. Even though they were discovered before antibiotics, in the western world the use and application never really took off. Antibiotics had some distinct advantages in comparison to phages and were therefore used as standard treatment against bacterial infections in the west. Give a group of bacteria two weeks time, and they will mutate to the point where they are resistant against onethousand times the normal dose of antibiotics. This is what scientists found using a petridish the size of an average desk. Harvard researchers wanted to show how bacteria become resistant to antibiotics and developed a test to do so. They made a giant petridish filled with agar; a jello-like substance that accommodates bacterial growth. The giant petridish was divided into nine sections. The outer strips contained no antibiotics and towards the middle of the plate, the doses of antibiotics increased tenfold. E. coli bacteria were placed in the outer strips. At every new strip, only the mutated E. coli bacteria survived. These could handle the antibiotics and then replicated until they reached a new inner-strip. This process repeated itself until eventually the bacteria became resistant to even the highest dose of antibiotics. 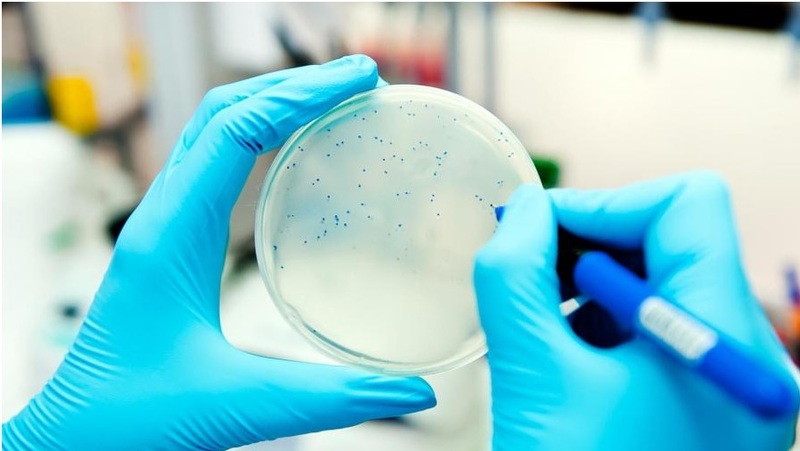 Even though this experiment is more realistic with a large petridish as opposed to the smaller dishes, the researchers emphasize that this enormous petridish does not accurately represent the real world. This experiment for example is not representative of how bacteria become resistant in hospitals. NTR is the independent Dutch public service broadcaster specialising in information, education and culture. NTR’s themes are based on the statutory duties of the three public service broadcasters which in 2010 merged into NTR: NPS, Teleac and RVU. In the Dutch public service broadcasting system NTR is one of the large broadcasters with a statutory public service mission. These broadcasters distinguish themselves from a large number of broadcasting associations whose existence is dependent on members. NTR is independent and non-affiliated, and can focus entirely on substance. NTR wants to make special programmes for everyone – programmes that educate people and enrich their lives. NTR expresses its identity in its logo: NTR colon. NTR has a great deal to say and to show. NTR stands for depth and enrichment, for information and surprise, for development and for personal growth.